DOWN-SET-HUT! 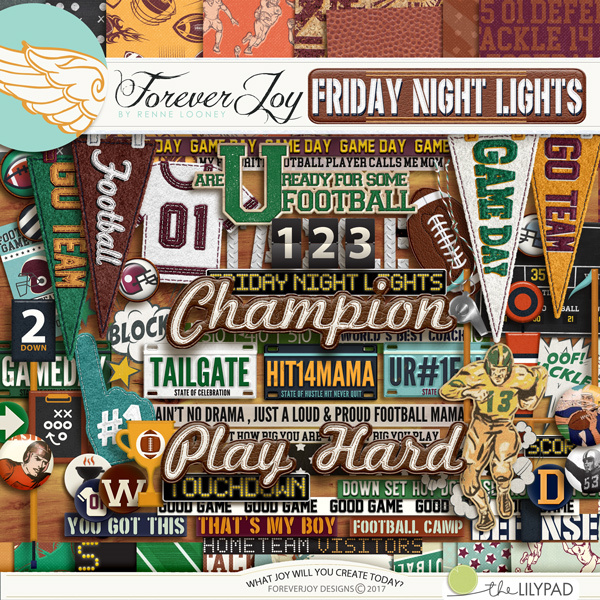 It's gametime and this kit was designed to help you capture your gridiron stories with fun! Inside you'll find the following line up: 19 patterned papers and 8 Bonus Solids plus a Special Teams of pretties including 4 flairs, a strip of tough metal chevrons, 8 comic style cutouts to tell your story, 2 old time players, 7 rubber icon dots, 3 dymo strips, 4 vintage player flairs, 1 game day ticket to take you to the game, a goal post and down markers, a ref whistle to start the fun, 3 felt jerseys, a set of scoreboard styled numbers 0-9, 3 journaling tickets to capture those game highlights, 4 felt leaves, a paper lineup silhouette of players, a fan finger colored 2 ways, 4 felt pennants, 5 fun license plates, a playboard and scoreboard for you to fill in with teams and scores, 5 rubber snips, 4 strips of Vellum word art, a leather football, a game trophy, 4 strips of Washi and 9 pieces of Word art! *not all items are shown in preview. Drop shadows for illustration only. This digital kit has been saved as .png files at 300 dpi. Not all items shown. Personal Use Only please. This portion of the collection includes 19 patterned papers (and 8 bonus solids!) that will help you cheer you favorite player on! Love the papers? Check out the page kit where you can get find them bundled with the coordinating pretties! Algebra is like arithmetic, only X rated. -Designed for when you want to graduate your back to school layouts to tween and teen approved! 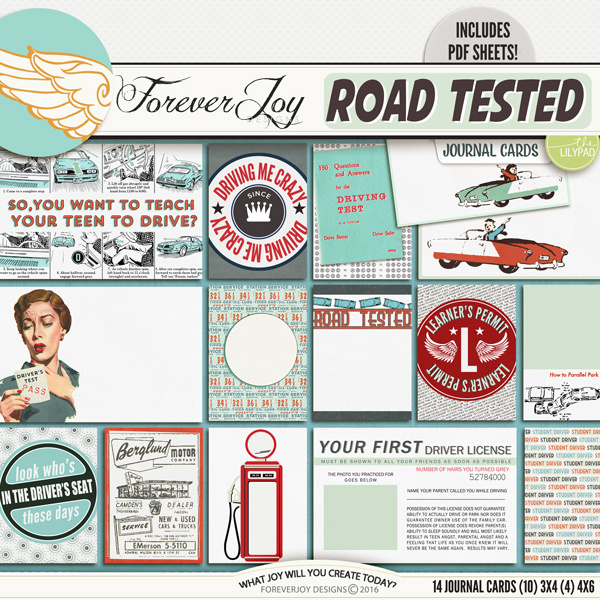 Enjoy both the papers and pretties togther in the Page Kit! Inside are 22 papers and 8 bonus solids + a smart collection of pretties including an apple for teacher, because you're never too old to get brownie points, an various books to overwhelm you with assignements, 4 brads, a book plate, a calculator (it's not cheating), an alarm clock and a desktop computer, a bulletin board and a chalkboard, 4 flairs, 6 flowers, glasses so you can look as smart as you are, a globe, the gold star you deserve, 4 leaves, tape to measure you up, scrap paper to show your work, a paper airplane, a pen and pencil, 3 felt banners, lables and tabs, 11 perfectly handwritten snippets, 4 painted bits, 2 journal stickers, a staple, 5 strips of washi tape, a wise little owl and 7 pieces of too-cool-for-school Word Art- *not all items are shown in preview. This item coordinates perfectly with the other August 2017 BYOC products! Drop shadows for illustration only. This digital kit has been saved as .png files at 300 dpi. Not all items shown. Personal Use Only please. This collection of pretties includes an apple for teacher, because you're never too old to get brownie points, an various books to overwhelm you with assignements, 4 brads, a book plate, a calculator (it's not cheating), an alarm clock and a desktop computer, a bulletin board and a chalkboard, 4 flairs, 6 flowers, glasses so you can look as smart as you are, a globe, the gold star you deserve, 4 leaves, tape to measure you up, scrap paper to show your work, a paper airplane, a pen and pencil, 3 felt banners, lables and tabs, 11 perfectly handwritten snippets, 4 painted bits, 2 journal stickers, a staple, 5 strips of washi tape, a wise little owl and 7 pieces of too-cool-for-school Word Art- *not all items are shown in preview. 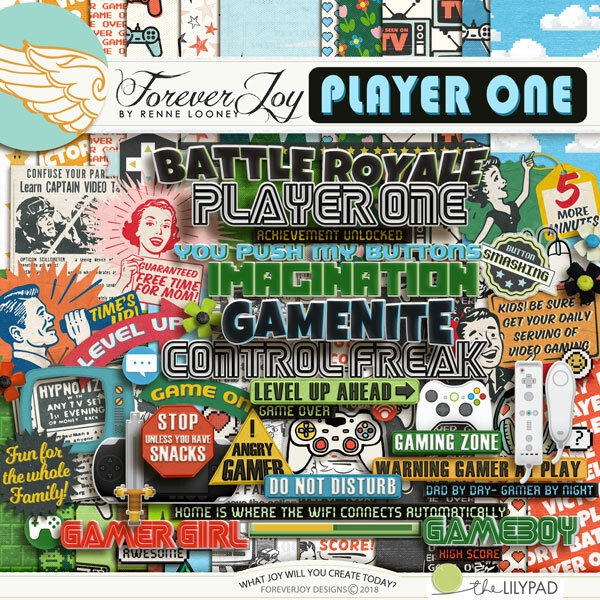 This item coordinates perfectly with the other August 2017 BYOC products! Drop shadows for illustration only. This digital kit has been saved as .png files at 300 dpi. Not all items shown. Personal Use Only please. Once you leave grammar school, you're in the Big League baby! 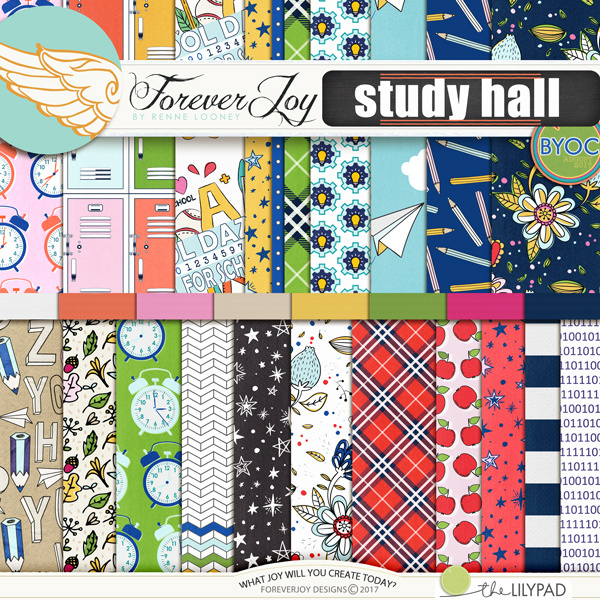 This portion of the collection includes 22 patterned papers (and 8 bonus solids!) Love the papers? Check out the page kit where you can get find them bundled with the coordinating pretties! Speak fluent emoji? Feelin' the feels? This pack of pretties has got you covered! Packed with vibrant neons and a fun style- inside you'll find 13 felt emojis- each colred 2 ways for a total of 26 to choose from (!) - five emoji brads, 5 emoji flairs, 5 flower stickers, a polaroid style frame colored 4 ways, a journal label colored 4 ways, 4 washi strips, and 20 different pieces of Word Art! This item coordinates perfectly with the other MAY 2017 BYOC products! Drop shadows for illustration only. This digital kit has been saved as .jpg files at 300 dpi. Not all items shown. Personal Use Only please. Speak fluent emoji? Feelin' the feels? 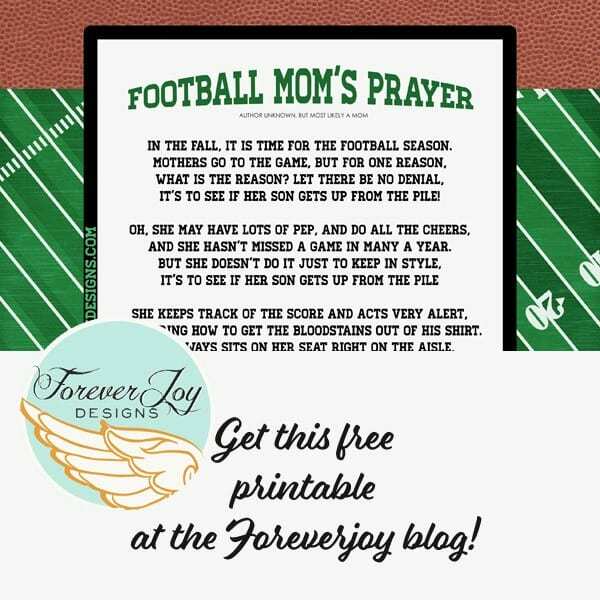 This fun paper pack has you covered! 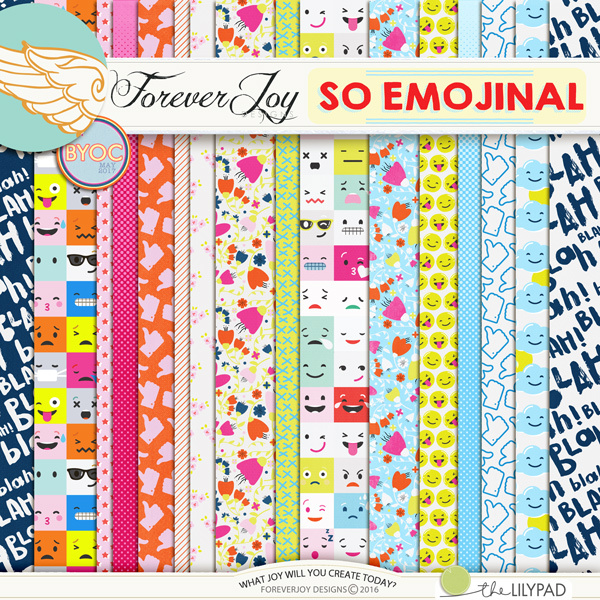 Inside you will find 15 fun patterned papers (and 5 bonus solids!) 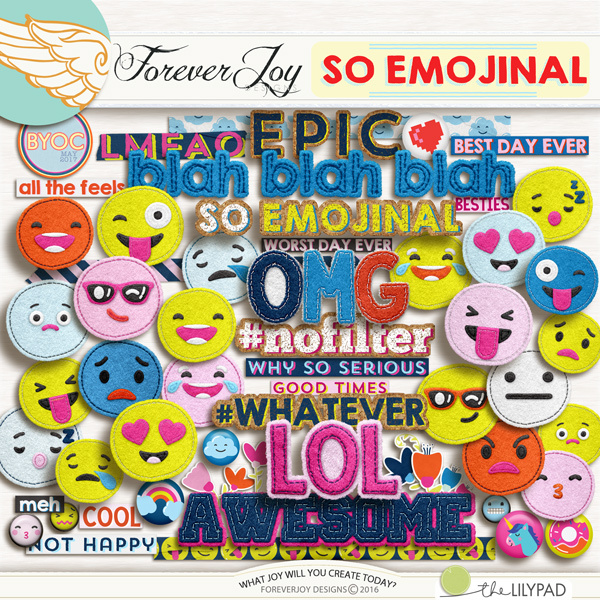 that coordinate beautifully with the SO EMOJINAL PRETTIES PACK! From the mind that brought you brought you the 2014 thriller, THIS IS SCARY and 2015 TEEN PARENT ZONE comes a new chapter in tales of terror and Anxiety! Nothing can prepare you for it. No blog post, no self help book, no legal pharmaceutical. You are on you own to face the ultimate terror- and failure is not an option. Buckle up- and brace yourself for ROAD TESTED! 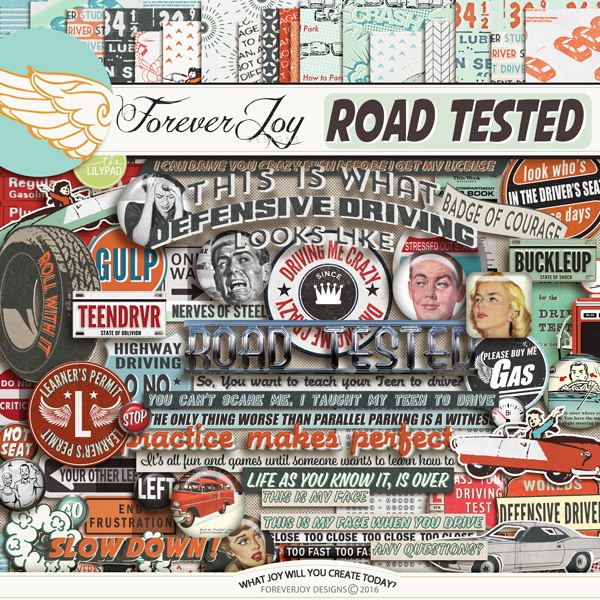 Included are: 22 patterned papers and 5 bonus solids, 9 brads, various retro styled cars, 13 flairs, a badge of courage, 26 pieces of spine chilling Word Art, retro gas pump and gas price sign, 2 joyriders (one male and one female) a vintage road manual, 3 license plates, the Serenity Prayer, a vintage car ad, 5 road signs, a retro road test booklet and answer sheet, a traffic cone, 2 dymo strips, 4 strips of washi and over 20 different pieces of Word Art all designed to help you laugh in the face of your terrifying joy ride! Drop shadows for illustration only. This digital kit has been saved as .jpg and .png files at 300 dpi. Not all items shown. Personal Use Only please. Included are the 14 cards shown (4) 4x6 and (10) *3x4 cards in png format as well as (3) PDF Sheets. *The 3x4 cards are actually 2.9x4 so they will fit perfectly in your Project Life pocket pages- no extra trimming or guess work needed! Drop shadows for illustration only. *Previews may show pieces of this element pack combined with the coordinating Paper Pack and Pretties. Sometimes the best plan is to get lost and just enjoy the journey without really knowing where you will be ending up. To explore for the delight of it and to treat everyday as an adventure of sorts. It's amazing how much can be found when you let yourself get lost! Included: 19 patterned papers + an additional 4 solid bonus papers and an awesome collection of pretties including: 3 arrows, a scattering of beads, an adventurous little bird, 2 cork spots, 2 bows,1 berry branch, 3 brads, one butterfly, 2 buttons, 3 charms, 2 flairs, 9 flowers, 2 leaves, a cluster of twigs, a painted wood frame, a veneer globe, a little gold key, a paper plane sticker, a staple, a summit to conquer, a scattering of stars and a star burst sticker, a leather journey tag, a wooden "go" tile, 3 vellum quotes, a vintage milk cap, 2 leaf stickers, 9 pieces of word art and 3 strips of washi tape. *not all items are shown in preview. Drop shadows for illustration only. This digital kit has been saved as .png files at 300 dpi. Not all items shown. Personal Use Only please. There is a strange dimension waiting for those who have children: a dimension where the rules and dialog and dynamics that once worked so well are now turned upside down and logic no longer applies. It is a world of drama and dynamic change and it is horrifying and delightfully satisfying all at the same time. It is a 5th dimension of parent known as, The TEEN PARENT ZONE. Included are the 14 cards shown (4) 4x6 and (10) *3x4 cards in png format as well as (3) PDF Sheets. *The 3x4 cards are actually 2.9x4 so they will fit perfectly in your Project Life pocket pages- no extra trimming or guess work needed! Drop shadows for illustration only. *Previews may show pieces of this element pack combined with the coordinating Paper Pack and Pretties. Included in the Page Kit are 19 papers, 12 brads, 12 flairs, a scattering of crystals, a backwards clock, a lady falling helplessly into this strange dimension, a straight laced narrator, a robot silhouette, a signpost up ahead, a spiral and stars, 2 TV sets styled solid and transparent for you to broadcast your own thriller, a page from a vintage year book, a wavelength, and 26 pieces of spine chilling Word Art, all designed to help you laugh at the terror you must now face. Behind every great player you'll find hundreds of hours of coaching, practice and workouts, piles of equipment (and laundry!) but most importantly- their biggest fan- YOU! Switch up the way you tell your game highlights a bit by focusing on the view from the sidelines! It's a perspective that will not only add depth to your story telling- but also give your favorite player a peek into what's behind your game face too! The design contains specialty papers that bring your court side as well as a fun chain link .png styled paper-since that's the way we view so many games!- and just enough pink and girl friendly sentiments to make it the perfect equipment for all your favorite players!